Matt Baker presents the DEC East Africa Crisis Appeal. Browse content similar to DEC East Africa Crisis Appeal. Check below for episodes and series from the same categories and more! 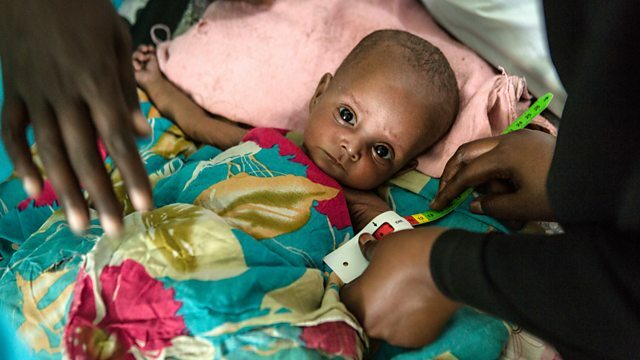 Hunger on a massive scale is looming across East Africa. If we don't act now, it will get much worse. some form of humanitarian assistance. and in urgent need of food, water and medical treatment. The UN has declared a famine in parts of South Sudan. people are also now dying of hunger. Without immediate help, they are at risk of starving to death. On top of this, outbreaks of cholera are making life even harder. to reduce the scale and the severity of this crisis. There is plenty of food in this world. Nobody should be dying of starvation in 2017. £5 could provide a week's food. £25 could provide a month's supply of life-saving peanut paste. treating severely malnourished children for a whole week. and the whole £5 goes to the DEC East Africa Crisis Appeal. You must be 16 or over and please ask for the bill payer's permission. For full terms and conditions, go to dec.org.uk. Whatever you give will make a difference. when faced with this type of situation. Your generosity is inspirational, and it's admired across the world. Let's not let the people of East Africa down. Thank you. DEC East Africa Crisis Appeal PO Box 999 London EC3A 3AA.